I hadn't updated the silver chart since February when I warned you that the metal dangerously approaches the support of the Triangle pattern. After that, I posted a gold update as I found an amazing historical similarity there. There’s been so much water under the bridge since February, but nothing had changed in the precious metals markets until the end of last month when the crucial trigger was pulled. Below is an updated chart of the silver that I would like to share with you these days as it contains an excellent trading opportunity. 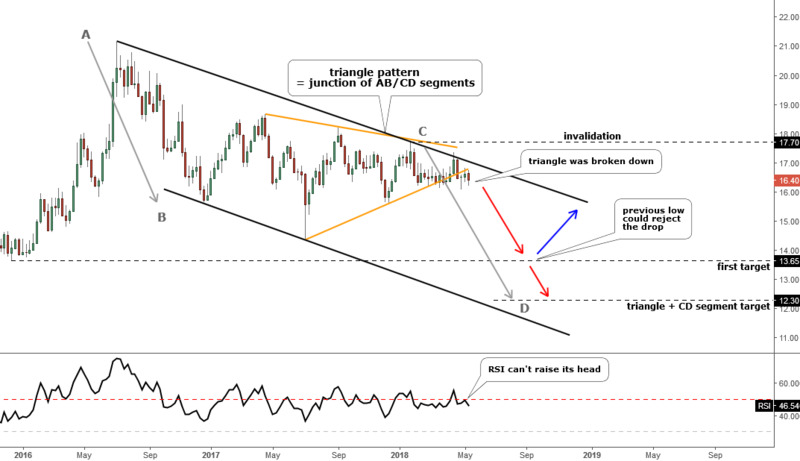 Silver could escape from that troubled situation which I pointed out in February as the price briefly punctured the downside of the Triangle pattern (orange) and then happily reversed higher on the back of broad dollar weakness. I added the black downtrend channel on the chart that was built through the visible extremes. It helps to understand why the promising rally in the silver market just stalled in the middle of April in the $17.3 area as the upside resistance was right there to block price growth. The earlier top of $17.7 was so close to being touched, but the market lacked the fuel to launch the rocket. As whale traders say, if nobody buys I start to sell. So, silver reversed down at the end of April, and in a single weekly candle, it finally broke below the downside of the Triangle. The following two weeks the price stayed outside of the pattern, but in a very narrow range between the $16 and $17 marks to pull back to the broken support and retest it. This week’s candle has already been bearish red, and it could grow in size to crack down to the $16 handle by the end of the week. I put two targets on the downside. The first one sits on the previous major low established at the end of 2015 at $13.65. I think this area would offer strong support for the price as all eyes would be there as speculative traders would try their luck to buy into this level. Cautious traders could look into booking some profits there as the risk/reward ratio would be two if we would cut short positions beyond $17.7. The second target represents two unbound calculations. The first one relates to the Triangle pattern. You are already familiar with that math when we subtract the widest part of the pattern from the broken support. The other one is derived from the AB/CD concept (gray annotations). The length of the CD segment equal to AB segment hits the same area as the Triangle pattern’s target at $12.30. Again, we witness the magic power of math as we got the same outcome from unrelated chart structures. As I mentioned above, we should limit our risk just above the former top established within the Triangle pattern beyond $17.7. Please share your view and hit the answer you like below. Silver is going down due to the strengthening dollar and in short term is at the mercy of that. The real question is how is silver doing against a breadbasket of currencies? The monthly and weekly silver charts look super bullish! its going to fake everyone out and Break to the upside …. $32--$37 targets ..